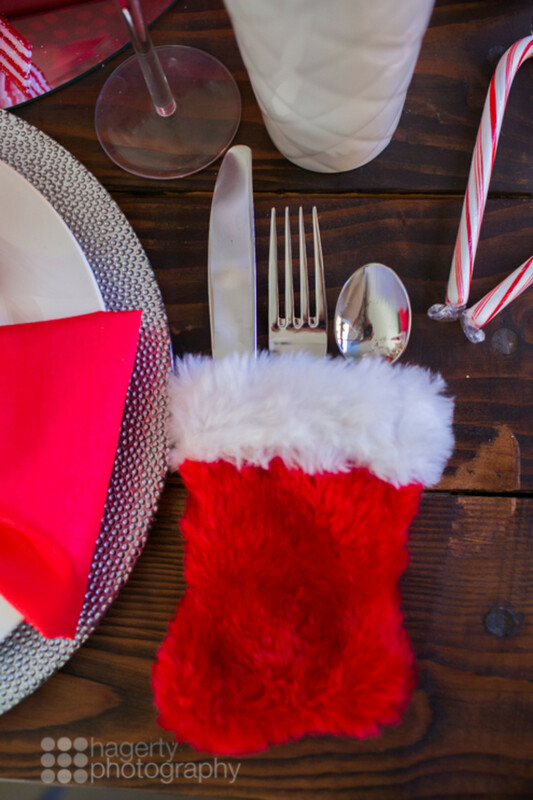 Christmas is right around the corner and you’re probably starting to think about decorating your table for your family’s Christmas Eve or Christmas Day dinner! 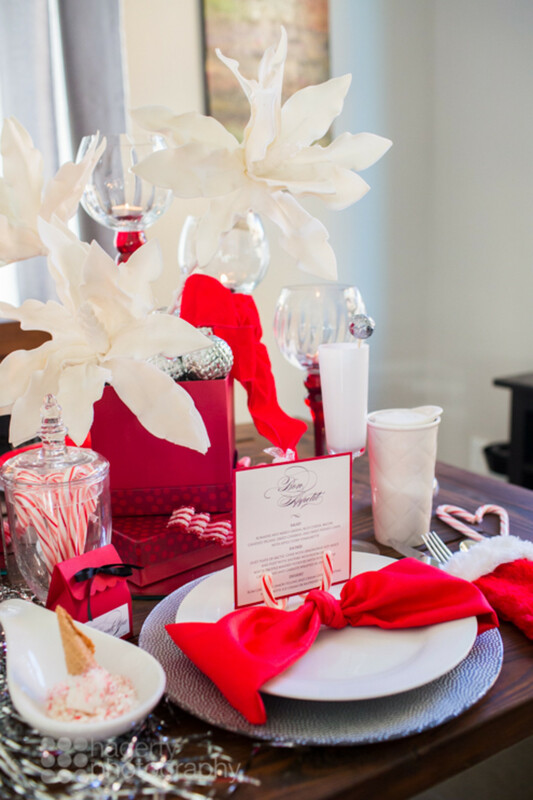 A festive tablescape this time of year is a necessity, isn’t it? 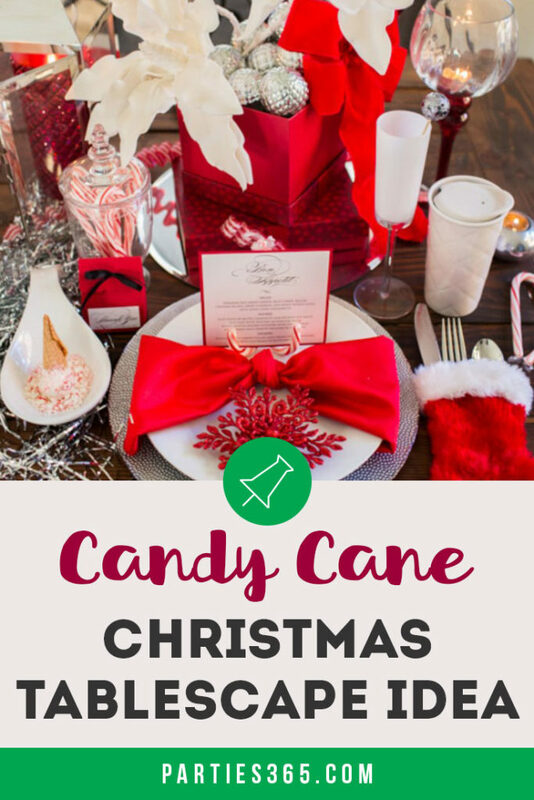 Whether you’re hosting a Christmas dinner party, brunch or just an intimate dinner for family or friends, this Candy Cane Christmas Tablescape is sure to inspire! 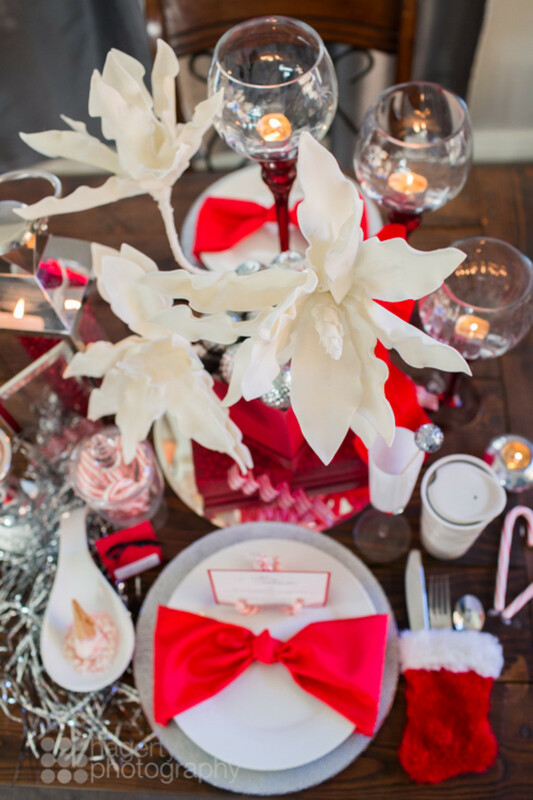 Bright reds, whites and silvers paired with candy canes and poinsettias, really make an impact on this gorgeous holiday table. Grab a cup of coffee and a Christmas cookie and scroll through these photos to gather ideas for your Christmas Tablescape. 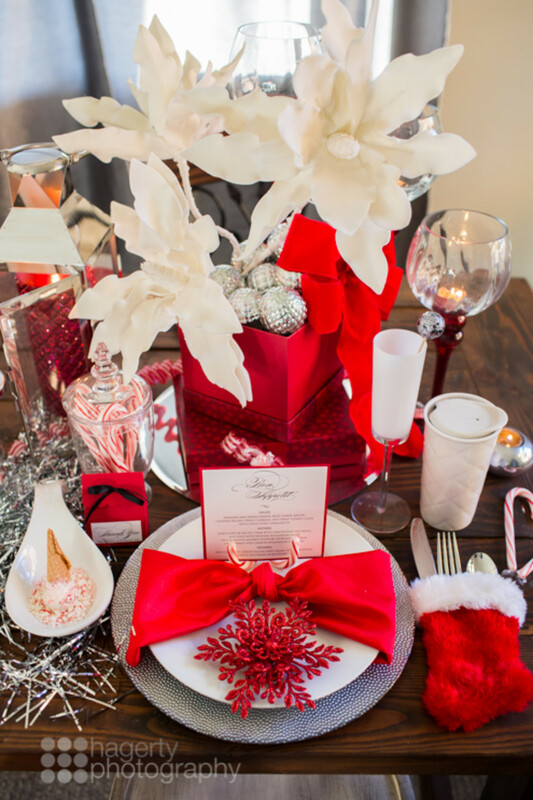 This colorful holiday tablescape is the brainchild of event planner Tasha Miller of Meant2Be Events. 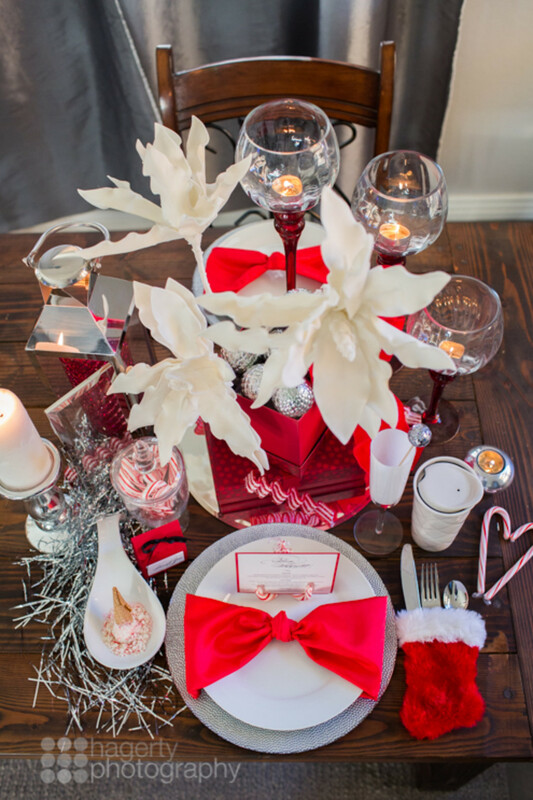 Inspired by the traditional reds and whites of Christmas candy canes, she set out to design a place setting that could easily be replicated at home while still making a big impact on guests. One of the first things that catches my eye is the Santa hat hanging on the corner of the chair. You could even take it a step further and have the hats embroidered with your guests’ names so they act like a name card for each place setting! Moving on to the place setting, I absolutely love that the bright red linen napkin was tied like a bow on a present around the dinner plate! Such a fun detail, perfect for this time of year! The dinner plate and napkin are placed upon a sparkling silver glitter charger and it really pops against the dark wood table. 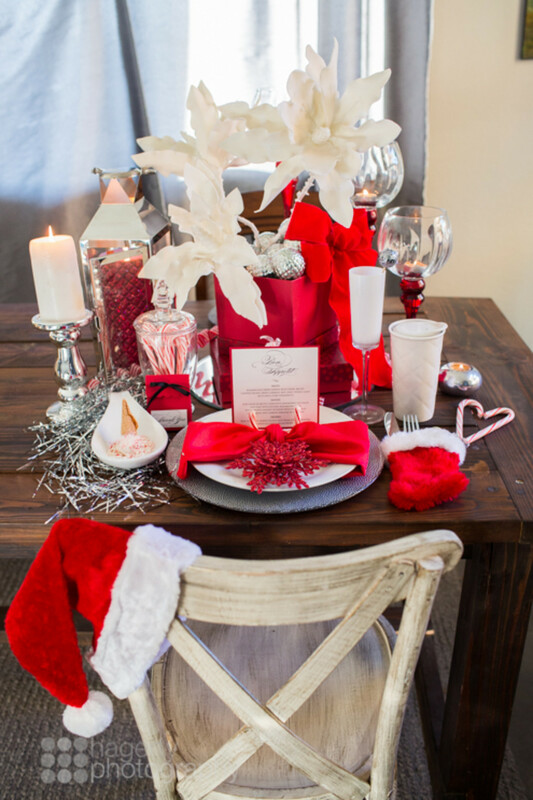 Including a custom menu as part of your Christmas tablescape is always an elegant touch. These simple menus with a red border were designed by Be In Love Designs. 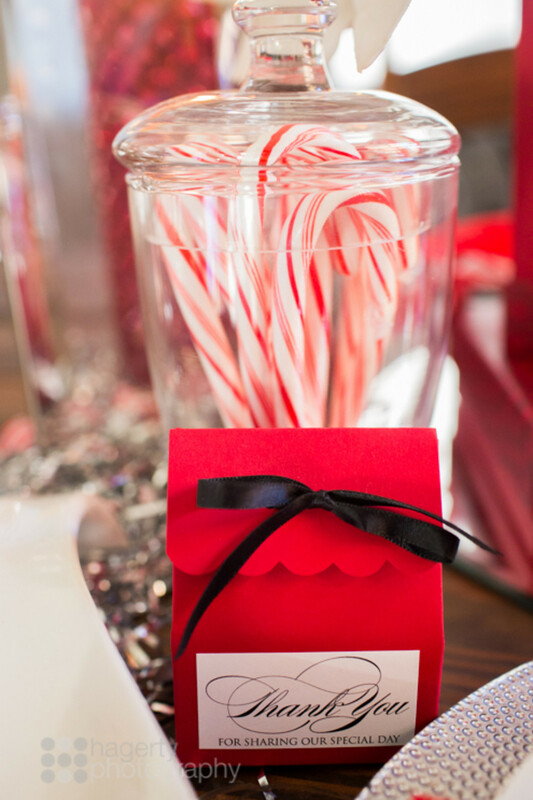 Using two candy canes to create a menu stand is a brilliant detail that goes perfectly with the theme of the table! You can see more beautiful themed menus, invitations and stationary from Be in Love Designs in their Etsy shop. 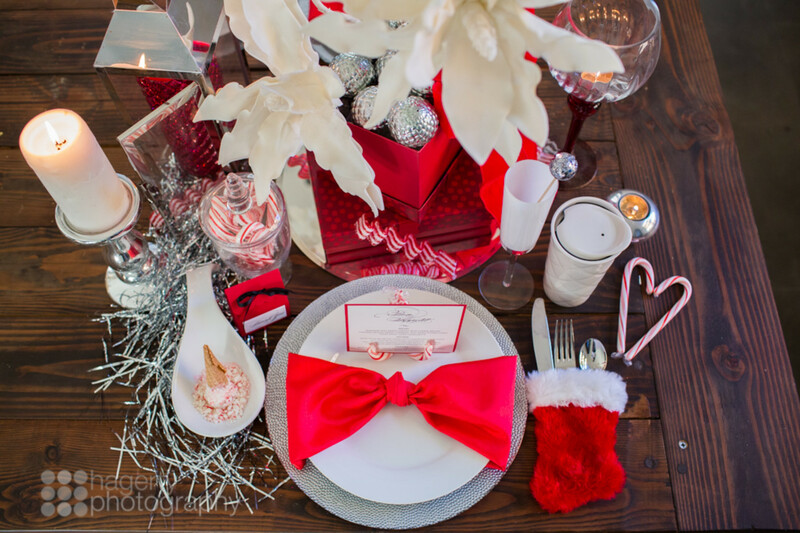 I adore the red Santa stocking holding the cutlery at this place setting, don’t you? This is sure to delight guests – both big and small! We also found these darling Santa Suit Christmas Silverware Holders that would be cute on your table too! 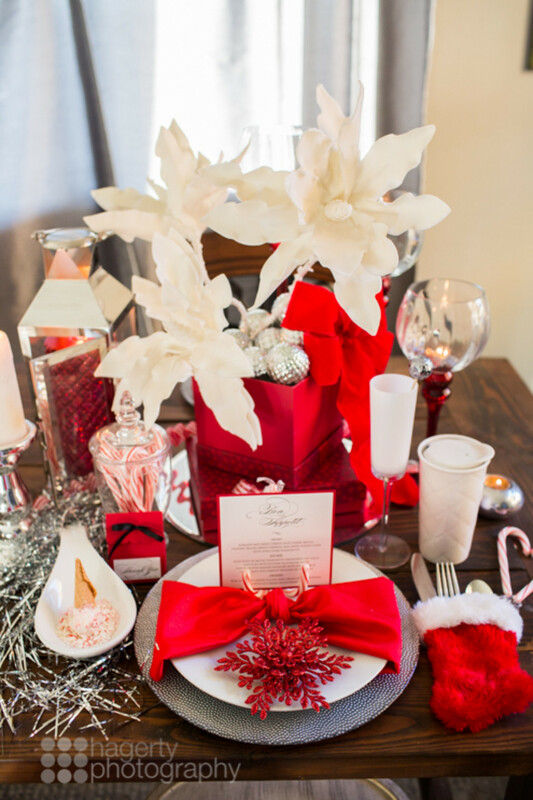 If you want to add a Christmas Party Favor to each place setting, the photo above shows how beautiful an intricate red snowflake ornament would look sitting on top of each plate! This Christmas centerpiece idea is simple, yet stunning and something you can easily – an inexpensively – recreate at home! It all starts with a a base of red gift boxes. Tasha chose a larger flat box to start with and stacked an open, taller matching box on top. I’ve seen similar gift boxes this time of year at most craft stores. Next, she filled the box with silver ornaments, added a large red velvet bow and placed three large white silk poinsettia flowers into the ornaments. Beautiful! You could also use real flowers and simply hide your vase in the box with the ornaments on top. From the red stemmed crystal tea light holders to the silver lantern filled with a large red candle, this table has so many special details. First, let’s talk about the featured dessert! Isn’t this crushed candy cane ice cream cone, created by Fresh from the Kitchen, a unique presentation? 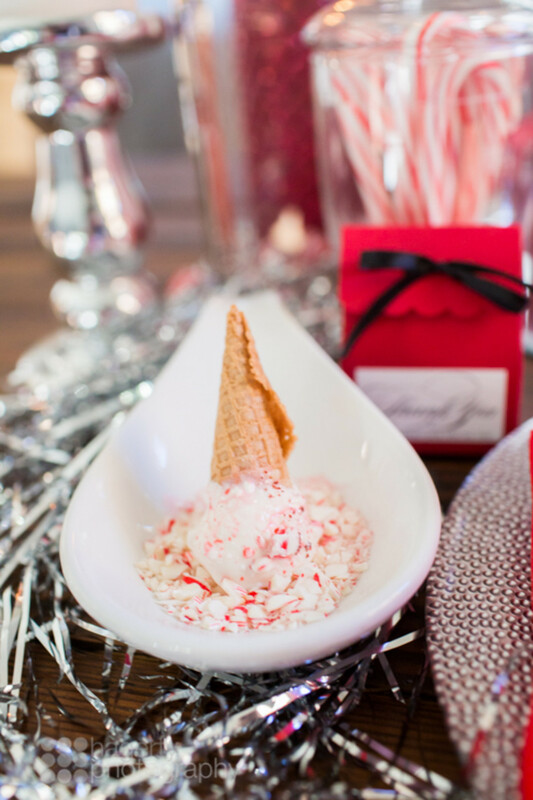 I just love an unexpected element to a dinner party and I think serving dessert this way – as an upside down ice cream cone dipped in candy canes – will delight your guests! Plus, what a genius way to dress up a simple sweet treat! Did you notice the silver glitter stir stick in the frosted champagne glass? 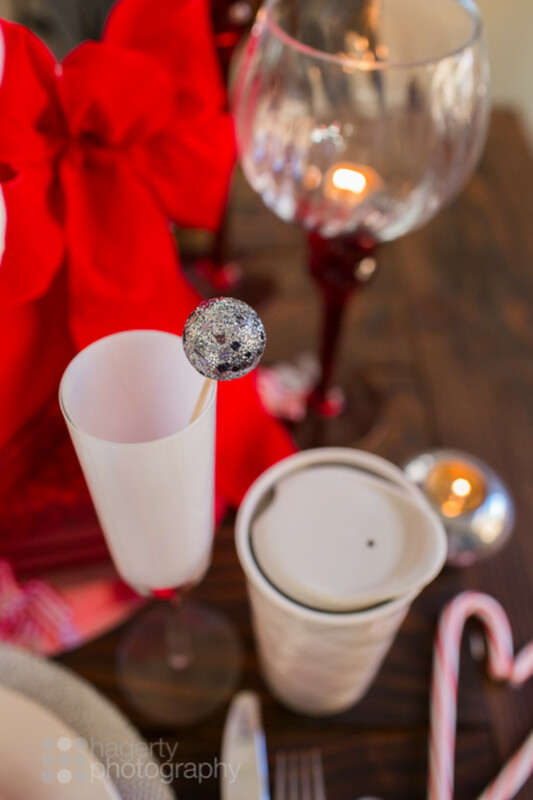 Festive cocktail stirrers are a fun way to add a little pizzaz to your tablescape! This one was created by Chasing Bliss Design and she has some adorable Christmas cocktail stirrers in her Etsy shop! I also love this apothecary jar filled with candy canes! Such an easy Christmas decor idea with big impact! The red favor bag with scalloped edge and black satin ribbon is a lovely thank you for guests as well! You could fill it with Christmas cookies, candies, a small ornament or other special memento to help them remember the celebration. Did you find some ideas to help you decorate your Christmas table? 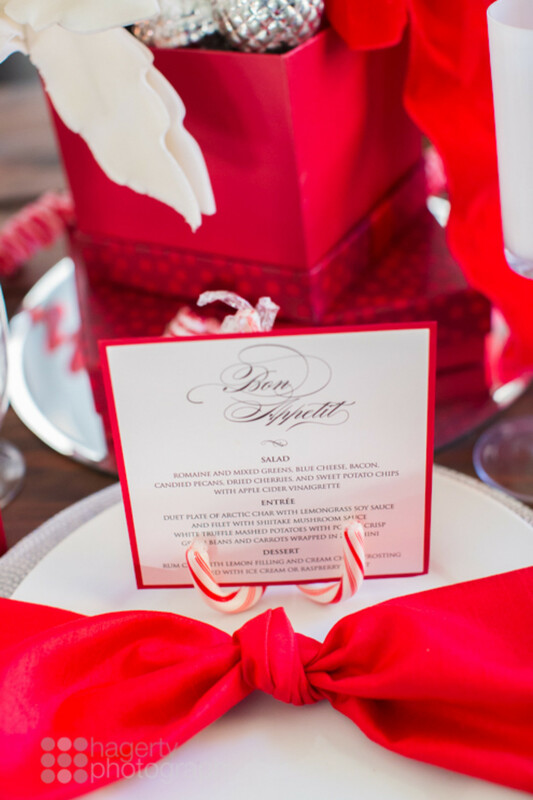 We hope this Candy Cane Tablescape provided some festive inspiration for your holiday events! 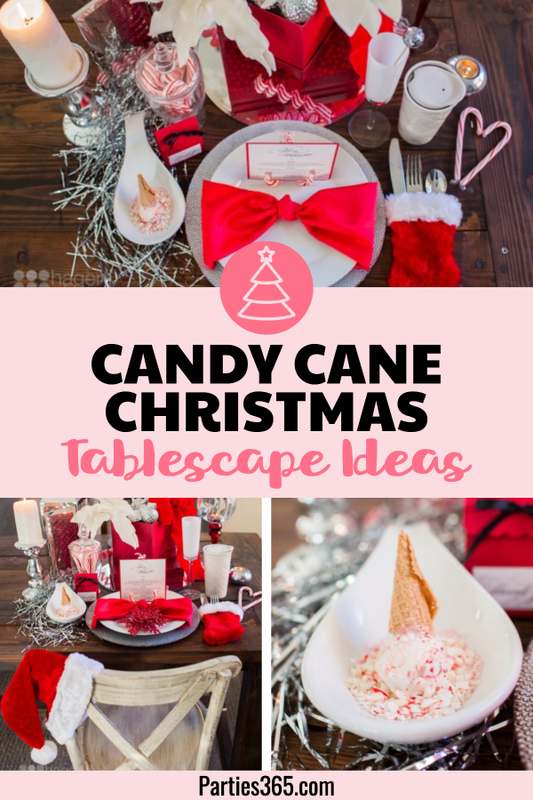 You can check out other tablescape ideas here and be sure to Pin this post for later as well!